A world of hackers, connectivity and automotive processors – what’s secure enough? If you hack the radio, can you send messages to the brakes or the steering? And if you can, what can you do with them? That’s what two white-hat hackers wanted to know. In their now famous car hack, they remotely killed the transmission of a Jeep with a Wired reporter behind the wheel. In that moment, the potential of car hacking became real to the world. Much has changed in the automotive industry since then, but to no one’s surprise, security has become a top concern for automakers. New cars are loaded with electronic controllers, computing power, lines of code, and wireless connections to the outside world. The attack surface is enormous. And the media fallout of an attack can be detrimental to a carmaker’s brand. As we saw in the Jeep hack, once a hacker gained control of the radio, it was easy to wreak havoc with the steering and braking systems through the in-car network. It didn’t have a secure gateway, which acts as a firewall and controls the handling of messages in and outside of the car. 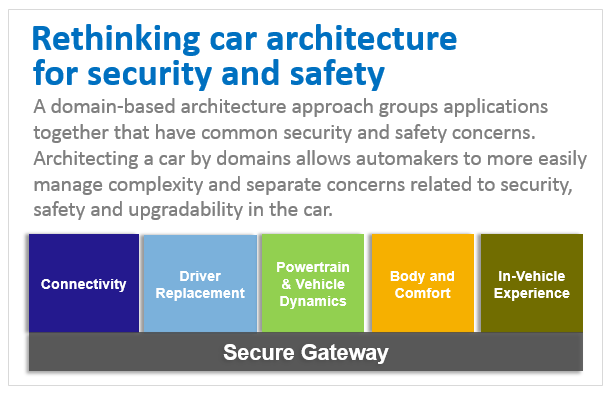 A gateway also isolates safety-critical systems from other applications like infotainment. In-vehicle networks must be protected against intruders manipulating and stealing data. This means that vehicle network architectures must be reconsidered, separating – isolating – the various domains inside a vehicle network. Also, strong encryption and authentication must be used to ensure the car is securely communicating with known and trusted entities only, as well as to protect code and data that resides inside the vehicle network. What other security precautions do carmakers need to make? What kind of hardware security do automotive processors provide? These are some of the questions and concerns we hear across the industry. Automotive processors generate, process, exchange, and store massive amounts of sensitive data —making them an attractive target for hackers. They must have high levels of security. 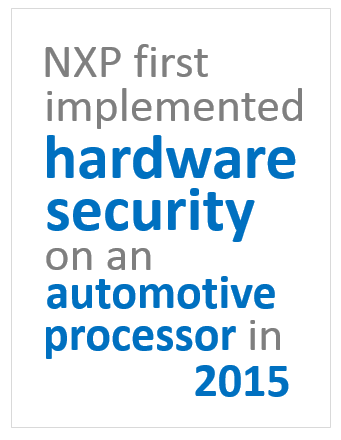 As early as 2015, NXP was focused on getting security right at the processor level. We released a dedicated automotive hardware security module (HSM) that offered on-chip security for automotive applications, to protect software from being manipulated, and support secure software updates and data protection. Even earlier, in 2010, we released an automotive MCU that was SHE (secure hardware extension) compliant. 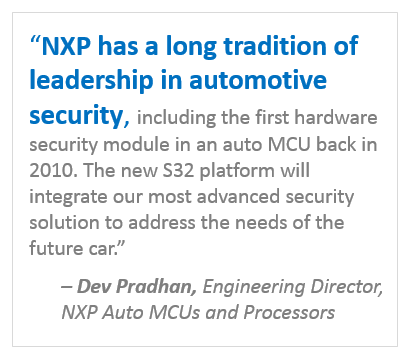 Today, every new automotive processor and controller that we make includes a dedicated hardware security module: on the S32, it’s called HSE (Hardware Security Engine) and on the i.MX 8, it’s called SECO (SEcure COntroller). Both modules, or engines, fully meet the functional goals and objectives of the ‘EVITA Full’ specification and independently manage the security functions without impacting the function of the processor or controller. Secure boot and real-time integrity checking schemes verify that the software is authentic, trusted and unaltered. These modules also add more flexibility to how automakers can fix security vulnerabilities, as they enable secure over-the-air updates that let automakers update software after the car hits the road – without a costly recall. Furthermore, lifecycle management mechanisms allow controlled lockdown of some of the controller and processor features. For example, debug and serial download are essential features during vehicle development and manufacturing – but they’d be invaluable tools for hackers if they were accessible on production vehicles! Lastly, there’s also built-in hardware protection against tampering of the processor voltage, temperature and power, and hardware-enforced resource isolation. Our new S32 automotive platform is designed for what’s coming in cars of tomorrow – fast-to-market cars with rich in-vehicle experiences and automated driving functions. It adds up to even more software and more complexity. (Read more about how S32’s common architecture helps automakers reduce software complexity across the car). To cope with the increasing security requirements on today’s powerful ECUs, such as secure gateways and driver assistance systems, the S32’s embedded hardware security engine (HSE) increases the rigor of the implementation of the cryptographic algorithms, leveraging technology and know-how from the financial, banking and government identification industries. Applications processors have come a long way. With roots in the earliest forms of telematics, today’s driver information systems, including heads up displays, digital clusters, navigation, media players, and voice and data communications, concurrently run multiple complex software stacks and require true security. Our approach is a layered defense that comprehensively protects the entire processing unit – from hardware and software down to the communication links. The i.MX 8’s secure controller (SECO) is the root-of-trust (RoT) for the system, not only for key management, but also for authenticating, monitoring and locking down the system controller firmware. It is also the RoT for multiple, concurrent operating systems, from power on to run time. Complementing the SECO is the i.MX 8’s hardware-based tamper detection and resistance capabilities and in-processor firewall domains that ensure data and memory integrity of services, raising the bar on safety and security of the driver information systems. Hackers must not be able to gain control of the car or to exploit the privacy of the driver and their data, including financial information. Automakers need to use security solutions that will protect the electronic systems against potential cyber attacks.